You could hear the distant sound of a tractor heading up the valley road. “Chossy” (Josiah Zechman, as he was known to valley residents) was coming out from his farm for his evening refreshment. It was 1948, a simpler time of party phone lines, flat head engines and cook stoves. But the rising innovation of the twentieth century was on the horizon. With the baby boomers generation in full swing a whole tidal wave of change was moving across the countryside. Some of the things the residents treasured would pass away so gradually they would hardly even notice. Neighbors still knew each other by first names, and communicated on a daily basis. People needed rest after a long days work, instead of exercise. They didn’t hesitate to help a neighbor build their home, gather crops, or even help raise one another’s children. A mischievous youngster couldn’t get away with skipping school with a whole caring community looking on. The small Green Point hamlet in northern Lebanon county PA was tucked between the first and second of the Blue Ridge mountains east of the Indiantown Gap military reservation. The community consisted of a two-mile stretch of farmettes and small family homesteads with a country store and fire house plopped right in the middle and a church on both ends of the valley like bookends holding everything in place. The humidity in the air of the warm summer evening was thick and sweltering. Chossy came over the hill and pulled his big red Farmall tractor into A.J.Wolfe’s little country store. He mopped his brow with his shirtsleeve, greeted the “regulars” sitting in their usual places on the front porch benches and headed inside. Stepping up to the counter he ordered the usual, a cantaloupe cut in half, scooped out and filled with vanilla ice cream. Still in his bib overalls from a hard day on his farm, he sauntered out to the front porch with his cool summer treat and joined in the evening discussion already in progress. In the winter time they would gather inside around the warm heatrola coal stove and swap stories and opinions of the days events amidst the swirls of smoke from their pipes, cigarettes and cigars. This was life around a typical country store. The landscape of our state was dotted with hundreds of them until the competition of large grocery stores and the mobility of residents created circumstances which caused their demise. They could no longer compete and simply faded out of sight. There are not many people under 40 who even remember them. But for those of us who do the memories are heart warming and unique. Hearing a ringing bell from the front door the owner would typically appear from behind a curtain drawn across a doorway behind the counter which usually led into his living quarters. He would greet the customers by their first names and usually inquire of their families welfare. The tongue and groove floor boards would provide a chorus of squeaks and groans as customers walked the bulging isles among the sticky fly catchers hanging from the ceiling. Distinct aromas from fresh ground spices, baked goods, Lebanon bologna or the molasses barrel by the counter filled the air. It sure wasn’t Walmart, but they somehow found room for all the essentials a person needed. Bib overalls, dry goods, canned goods, kerosene heaters, bulk cookies, dried apricots and ground coconut to mention just a few. You could try on shoes or boots, pick up muskrat traps, buy ammunition and shop for clothing and groceries all on the same stop! You could even buy ice from their ice house which was stored in layers of saw dust after being cut from their frozen pond in the winter time. Some residents would come in carrying fresh cream from their small milk farms or eggs from their hen-house to barter for needed supplies. The store owner would welcome them and send them home with a fresh supply of sugar and flour, not to mention some sugar drops, Mary Janes or huge malted milk balls to boot. Since many residents didn’t have automobiles they would depend on the stores delivery truck. In the morning the truck would deliver kerosene and pick up grocery lists with would be filled and delivered that afternoon. In addition to groceries, country stores provided something that many towns now lack, which is a sense of closeness, communication and community. It was a place where neighbors could gather for conversation, seek help or advice, or share a burden. They could do so while sitting on the front porch enjoying a creamcicle or soft drink pulled from the chilled water of the soda cooler. I’m re-blogging this post since I just started my 2016 Road Bike riding schedule. I need to drop at least 15 pounds to help alleviate some physical maladies which have cropped up over the last year. It’s amazing how carrying an extra three 5 pound bags of sugar around can affect your “frame” and your circulation system in a negative way! I’m a biker, you know, the peddling type. I began riding about 15 years ago and started with an old traditional 10 speed but soon graduated up to a 21 speed bike with index shifting under the brake hoods. No reaching for shifters because they are right there at your finger tips. It’s like riding a bike with an automatic transmission! Smooth shifting and a gear for every hill. I rode the MS150 ride seven years in a row. That’s the ride where you raise money for MS research and ride 75 miles from Cherry Hill NJ to Ocean City and then ride back the next day. One year I tacked on an additional 25 miles on the way down so I could check off “Do a century” from my bucket list. It was a rain or shine event and the weather didn’t always cooperate. There was one other thing that didn’t cooperate and that was my tube tires which seemed to always be going flat. The culprit was the many little pointy rocks that were strewn along the road. I became paranoid about missing every rock that was purposely positioned with the pointy side up in my path. Run across one of those babies and POW! Your tire goes off like a shot. I then learned that the secret to success was to have your tires pumped up to an incredible 100-120 pounds of air. With your tires pumped up properly those pointy rocks just ricochet off like a bullet hitting superman’s chest. So what’s the point? Well, I met an old friend this weekend. Floyd has lung cancer which is a huge burden to carry and it makes a person realize the important things in life and quickly come to a realization of your own mortality. It can also understandably affect one’s disposition. What was interesting about Floyd was that he was pumped up! He was full of laughter and joy. When he goes for his chemo treatments the nurses say that he encourages them when you’d think Floyd was the one needing encouragement. Floyd’s secret? Through a series of events a couple of years ago he came to the realization that he needed salvation so he turned from his sins and put his faith in Jesus Christ as his savior. He became a new creature in Christ as described in 1 Corinthians 5:17. Since then, life has thrown a myriad of pointy rocks in Floyd’s path but because of his new-found (pumped up) faith in Jesus Christ he has been able to navigate the terrain. This remedy is actually for all of us, which is true faith in Jesus and a regular daily diet of His Word the Bible, that keeps you pumped up and ready for whatever pointy rock life throws in your path. I believe in a BIG God who created me, the world around me, the solar system in which I live and the millions of galaxies in our universe. Yes, I believe in a BIG God! SO.. if He could do all of that it’s not difficult to imagine He is capable of directing and managing the tiniest event or things which happen in my “little” world. Afterall, He is all powerful, all knowing and all present everywhere. So where does God speak? Well, He’s God and He can speak from anywhere to those with listening ears, but is there a particular place or venue from which He is known to speak more clearly? We know He speaks clearly from his Word the Bible to those who take the time to read and meditate upon what they read, but putting the Bible aside for a moment, where historically has man heard from Him? You guessed it, in the mountains and in the wilderness! I can recall quickly many times recorded in the Scriptures where God spoke to His people sometimes literally or via the inner working of His Spirit, and more often than not it was…. in the wilderness! Abraham took Isaac up on a mountain and heard distinctly from the Lord. Moses was on the backside of the desert in the wilderness and a bush became engulfed by flames and he heard the voice of the Lord calling to him. He heard again from the Lord on the top of a mountain in a “cleft of the rock”. Then you have Joshua’s encounter in the wilderness with the Angel of the Lord promising He would be with him. Followed by Jacob who wrestled with God for a blessing all alone in the wilderness. Where did David go when chased by King Saul? He found refuge in the caves and rocks of the wilderness where he heard from God and wrote many of the Psalms. The prophet Elijah heard the “still small voice of the Lord” while hiding in a cave. Even our Savior the Lord Jesus had to at times go apart from the busy work of ministry to get alone in the wilderness to pray and seek the face of His heavenly Father. So where do YOU go? . It might not be on the top of a mountain (picture attached) like where last week I experienced a clear voice of the Spirit calling out to me, but it could be a park, a lake, a nature trail or mountain bike ride but somewhere you can be alone to take time to stop, look and listen for Him. He will not disappoint you. At the same time I’m not recommending you base your entire activity and relationship with the Lord by what you experience in the wilderness. I met a man this week who believed that all he needed was to experience God in nature which is a big mistake. There is no substitute for the weekly gathering of believers in a local assembly where there is corporate worship and teaching of the Word. But with the tentacles of social media all around you, with television, radio, smart phones and myriads of people, events and appointments screaming for your attention I recommend you find “Your Wilderness” and use an old acrostic for your pattern of communication with God. ACTS: A for Adoration of your great God. C for Confession of any sin the Spirit brings to your mind. T for Thanksgiving for all He has done for you. S for Supplication for requests you may want to ask of Him. If you are wondering about my mountain top experience I was there to thank the Lord for all of His blessings on me and seek His face concerning my recent retirement. 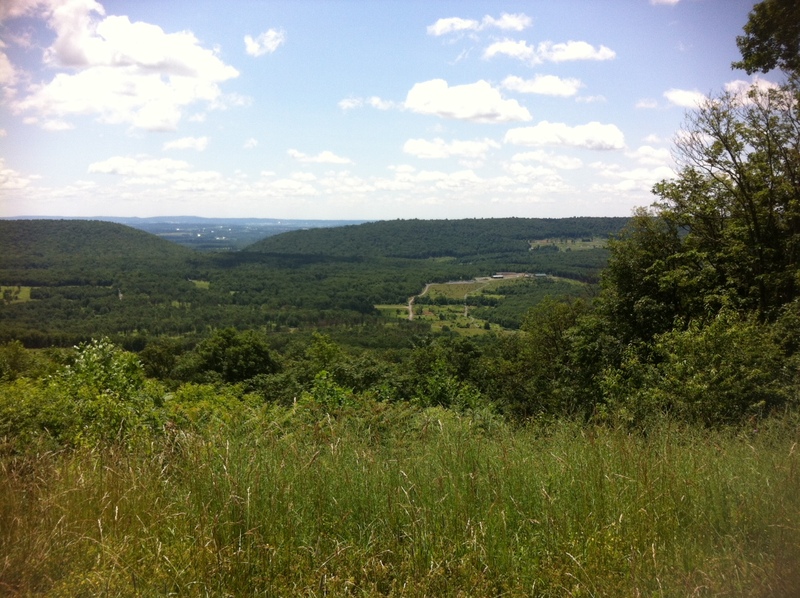 Upon arriving two young hikers approached me with whom I ended up sharing my faith. 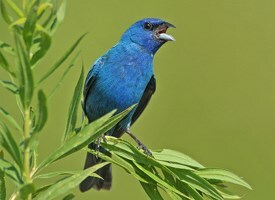 Then an Indigo Bunting flew by and began praising the Lord with his song. My phone began buzzing with texts from our 3 sons wishing me well in my retirement and then rang with a call from an old old friend bidding me the same. The voice of the Lord spoke quietly to my spirit saying “I am all around you, ministry is where you are, you are loved and supported by family and friends”. What more could I ask? See you in the wilderness! I heard an Australian say today that America is the greatest country on earth! What a breath of fresh air! He inspired me! In spite of our difficulties more of us proud Americans need to start speaking up about our love for this land. No matter what Political Party is in power, no matter the shape of our economy, no matter the unemployment rate or domestic crisis dominating the news, people are still trying to break the bonds of restrictive nations around the world and risk their lives to come to this great land. A plaque on the Statue of Liberty says “Give me your tired your poor, your huddled masses yearning to breathe free, The retched refuse of your teeming shore. Send these, the homeless, tempest tossed to me. I lift my lamp beside the golden door” (Emma Lazarus). Let’s be proud of America today. God Bless America!